Pen-and-ink and wash drawing by an Indian draftsman of a figure of Mahavira in the Meena Basti at Aihole, from an album of 31 folios of drawings of sculpture in the rock-cut caves and temples at Aihole and Badami, dated 1853. Aihole was one of the capitals and an important commercial centre of the Early Western Chalukya, a powerful dynasty which ruled the Deccan from the sixth century. Together with the two other capitals of Badami and Pattadakal, the site has preserved many Hindu and Jain temples which belong to a period that goes from the sixth to the 12th centuries, belonging to the Early and Late Chalukya periods and to the Rashtrakuta era. The Meena Basti is a rock-cut Jain cave temple situated south of the village. It was excavated in the late sixth century. It has a long verandah supported by four pillars and two pilasters. 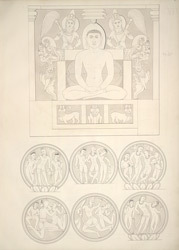 The drawing depicts the figure of Mahavira, the twenty fourth Tirthankara or Jain teacher, carved on the back wall of the shrine of the cave temple. Mahavira is seated in padmasana (lotus posture) in dhyana mudra (meditation) on a lion throne. Above him is a triple umbrella. On his two sides are chauri-bearers (fly-whisk bearers) attendants.